This Easter I wanted to do something a little different to our usual egg giving. When Christmas comes around you can always give something personalised, but Easter giving seems to be the same every year. So I decided to get myself an egg mold, some compound chocolate and start taking notes on everyone's favourite chocolate bar or biscuit. I am going to make half stuffed Easter eggs this year! 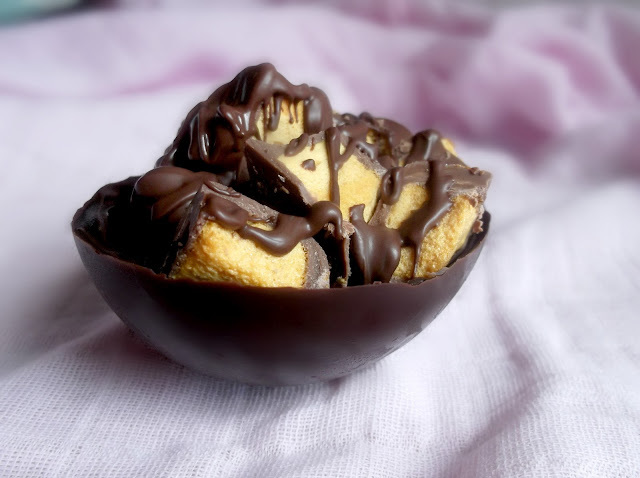 I've seen Easter Egg halves for sale like this before, often filled with nougat, rocky-road or fudge and thought how easy and pretty they would be to make. The family, not knowing my project, threw all sorts of wonderful favourites at me...mint areo bars, snickers, tim tams, honeycomb, kit kat, and the list goes on! I was thinking how pretty they would look set in their own little boxes tied with ribbon, or even shrouded in clear cellophane with a lovely tag and ribbon...great gift idea! 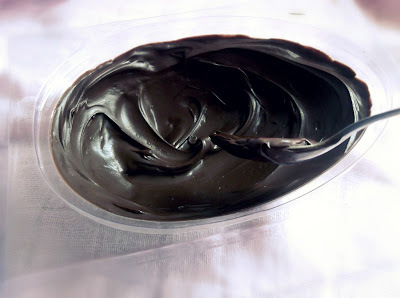 Melt the chocolate and stir until smooth. Brush on to the inside of the Easter egg mold until there is a thick and even coating over the entire surface. Be sure to make the edges thick as this will be the first thing to break if the coating is too thin. Reserve a little chocolate for the finishing touch. Set the mold in the refrigerator or freezer to dry. Remove from cold, and gently push out of the mold. 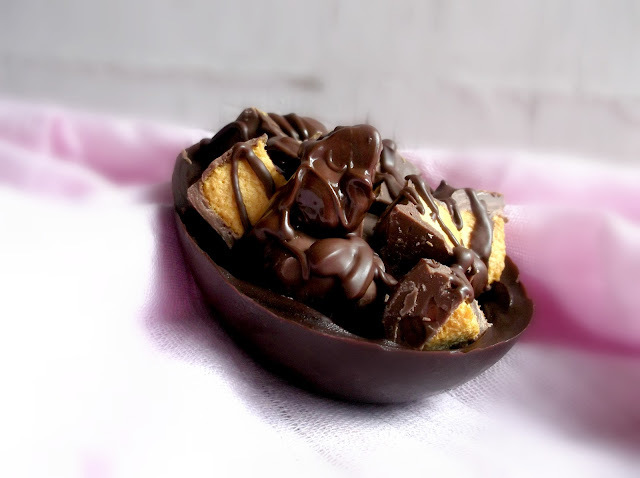 Fill with any sweet thing you desire--rocky road, clinkers, nougat, smarties, and then swirl over the reserved chocolate to ensure stability. Wrap in cellophane or set in a gift box if desired. 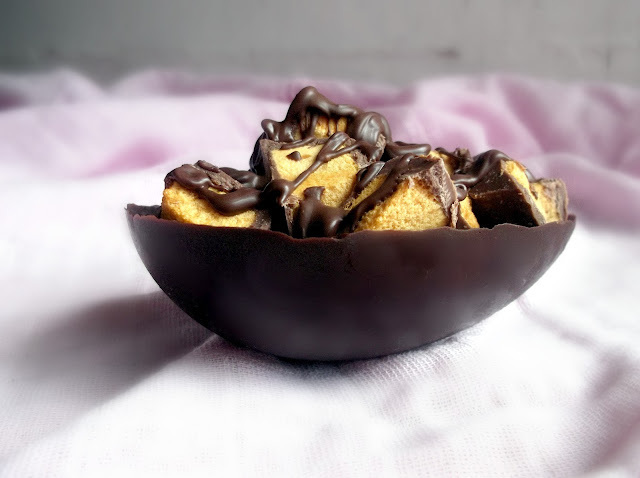 This is SUCH a lovely idea...I made some Biscoff-Toffee Easter Truffles the other day. I could make mini version of those and put them in a cute presentation like that for my family for Easter. Thanks for the great idea!! Thanks Wendy, the mini version sounds great! I'd love to see pictures if you end up doing it:) have a blessed Easter!